A century ago, artists played an important role in the formation of the National Park Service. Looking forward, Joshua Tree Art Innovation Laboratory aims to restore this role within the modern park service. Moving beyond making art for parks, JT Lab explores ways that the creative community can work with NPS to support our national parks. Using Joshua Tree National Park and Mojave National Preserve as testing grounds, JT Lab explores new roles that arts professionals and arts students can play in helping NPS pursue its mission of preservation and engagement. It enlists artists not solely as image-makers, but as creative thinkers, problem solvers, and communicators who are highly skilled at tapping into contemporary culture, generating new ideas, and engaging the public in fresh and innovative ways. JT Lab is led by artist Rebecca Lowry, who works closely with both Joshua Tree National Park and Mojave National Preserve on mission-assistive projects. A second experiment of JT Lab--the Volutneer Art Program (xB)--is directed by Jenny Kane. Read more about this program below or on the JT Lab website. Led by Otis College alumna Jenny Kane, xB builds bridges to local and regional art commu- nities by facilitating broad engagement. It allows artists to contribute on periodic or tempo- rary bases and accommodates many disciplines, ages and talents. All xB projects must be in some way pertinent to the park and its mission. Artists' Tea fosters conversations. These gatherings connect the local and visiting art community to the park. Come to hear a short presentation, witness a demonstration, discuss ideas, or simply enjoy a cup of tea. 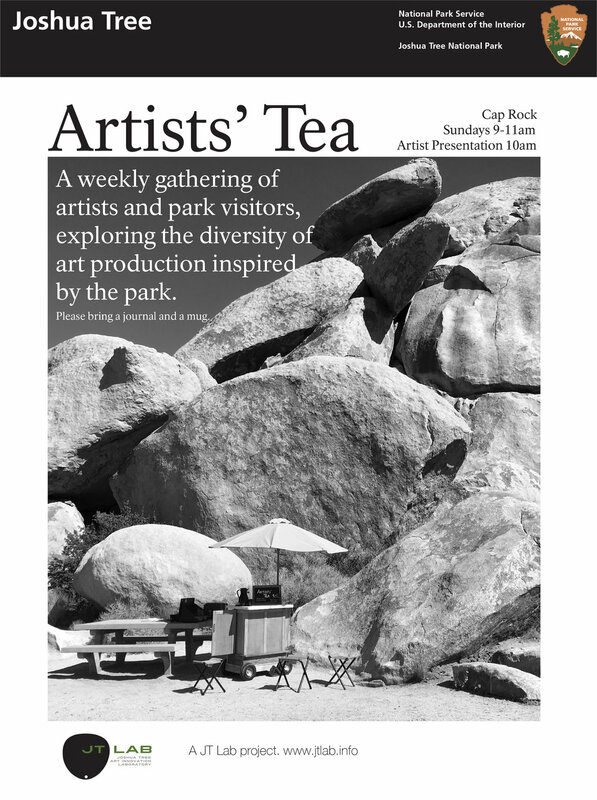 Artists' Tea is open to all and meets most Sundays from 9am to 11am at Cap Rock. Artist Programs give artists opportunities to supplement existing Joshua Tree National Park interpretive efforts with programs of their own design. Such projects may include guided artist walks or evening programs. Our first call for artists was released in January 2017 and the first group of selected artists will be announced in April 2017. Artist Programs will begin in October 2017 and run through Spring 2018. Artist Projects will provide artists undertaking substantial projects of their own the opportunity to collaborate with park staff or to access park resources so as to enrich or complete their project. We recently selected 6 artists who will be presenting starting in October 2017.